New Zealand catapulted themselves to victory at Headingley in the last match of their two-test series against England this week. One game prior, at the revered Lord’s, they were brushed aside by 124 runs. Social media was awash with fans giving New Zealand the upper hand headed into the first test. England had suffered from a catastrophical world cup campaign, coaching nightmares, and no form. New Zealand made it to the final of the same tournament, looking the team that was 100 times better prepared. Despite all the positives that England displayed over the two tests – Adam Lyth’s century, Alastair Cook’s runs, and James Anderson finding a long-lost groove again – the hosts problems still remain pertinent as ever. In general, the Kiwis were more consistent and more powerful across the two matches. Brendon McCullum’s towering six off Stuart Broad in the first innings at Headingley was yet another statement that New Zealand were in England to play an aggressive brand of cricket. England’s teething issues and team culture were only smoothed over by individual performances. New Zealand’s run rate shocked England into submission. McCullum’s relentless pressure with an increasing target meant the hosts had no answer – and therefore pinpointing the fact that pressure situations got to England. Caretaker coach Paul Farbrace will have a negligible impact on the entire tour. A new head is a temporary fix for a long-term plan. Mark Craig (7 wickets) had an average of 8 runs per wicket better than Moeen Ali (5 wickets). Alastair Cook faced 739 balls at a strike rate of 41.81. 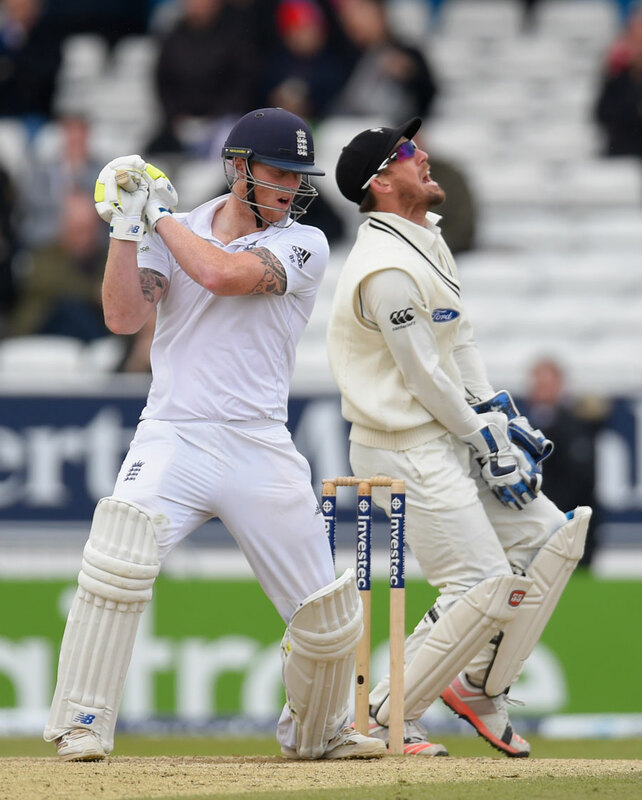 In contrast, Ben Stokes faced 254 balls at a strike rate of almost 90. At times, it was not pretty for New Zealand. No-one really found the line and length needed to bowl a scintillating Yorker, simply “pounding the pavement” and trying to lure England into a false shot. Trent Boult (13 wickets at 24.84) produced the most balanced bowling performances of the test series, finding swing and movement where others could not. Competitive? Yes. Prone to big mistakes? Yes. Problems fixed? No. England were 1/47, and then suddenly 4/62 thanks to Craig and Boult. The shots looked like something from a D-Grade park match, and fear had been struck into the hosts from the visitors. Fight and determination are not words recently associated with England. Farbrace’s words ahead of the ODI series that starts on Tuesday are a stark reminder that there are many large slippery stepping stones to overcome. Now the onus is on all players selected in the XI to repay the faith. Cook, so dry of runs two years ago, has found them again. He looked unsure in spots, even in a score of over 150. The weakest link is Gary Ballance, whose record has been sliding down quickly. Caught on the crease far too much, and with rash and timid shots, the left-hander has been kept in a side without motivation and life. Farbrace commented that England’s one-day game had to become modern, or risk being left well behind by the rest of the cricket world. Perhaps the most terrifying aspect for England is they have no front-line spinner. When Graeme Swann departed, the void was left and never entirely filled. In a similar manner, the rest of the side is trying to play catch-up. One series does unfortunately not make amends. They can’t spin their way into trouble, unless the reward from the risk is great enough to try. England have won just seven of their past 23 limited overs matches since the end of August, and two of those victories were during the World Cup. “We have a lot to do before we can be a consistent side that are winning games and series on a regular basis.” Farbrace’s words are emphasised by the fact Tuesday’s game is a must-win to get the ball rolling for England, who will continue to stare adversaries in the face with potentially dire consequences if beaten.